What was once a childish drawing is understood now. 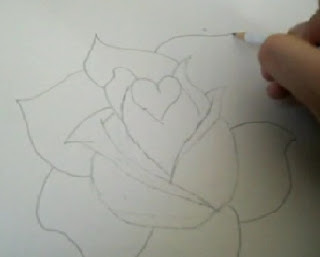 Only a perfect flower such as a rose fits to carry such strong meaning on its petals, that a heart shape drawn as the heart of a rose is no stroke or joke of an artist but is in fact innate to rose's natural form and beauty. Madly, deeply in love with apricot bloom. The tree that is may be 8-9 feet high. This rose stands wet weather well. Opens into beautiful dense double petals. There is a light scent. Makes beautiful cut flower. The next round it flowers, I have a vase ready. Dark green, slightly rugosed medium green leaves. Subject to seasonal blackspot. Though can stand being wet, it needs securing during heavy storm for being too tall. The tree that radiates a lot of love lately. Bushy habit and suckering well. Good plant. At times, to high to smell the roses. A mixture of apricot, pink, peachy and yellow. The balance of colors altering as the petals age. It ages into pale apricot, cream and and pink on hardened petals. On the inside the petals are yellow. Top view from a window. Your quote says it all. Your roses are gorgeous and I love them all! BangChik & Malar - Thanks for your nice words. I love Apricot Madness dearly as the flowers brighten my garden. Although it does have a problem with blackspot, I don't think I'll let go of this variety easily.